Many are oblivious to the importance of discipleship. Therefore, I find myself exhorting hundreds of people to get rooted in congregational/community life—get back to the basics (e.g., read the Bible, prayer). I always give these individuals contact information of local churches that they can attend. It saddens me to see what is happening in the transition from the point when someone makes a professed/salvation decision for Jesus and the overall discipleship/commitment aspect to our faith. The Hebrew word for disciple is “talmid.” A talmid is a student of one of the sages of Israel. A disciple is a learner, or pupil. When we decide to repent and turn to our Lord for the forgiveness of sins, we have to realize we are now on a new journey. The Gospel is a message for the here and now- not just the future. We have to learn how to live out our faith in the world around us. A disciple (in the New Testament sense) is someone who is striving (by God’s grace) to be consistent follower of Jesus. The goal of the Christian is to imitate our Master. Discipleship is not getting any easier in the world we live in. In an overly sensate culture, people need to be constantly stimulated and have a hard time focusing on something such as discipleship. And in a world that wants instant results, self- sacrifice is a tough sell. Part of the problem is that churches preach a Gospel that promises that Jesus will fix all our problems. And when things get tough, many people bail out. Discipleship takes a commitment between the discipler and the one being discipled. And for those that say they don’t need discipleship I can only respond with the following: I pity you. Sorry to be so blunt. But without discipleship, you are destined for failure. There is no such thing as a Long Ranger Christian. Also, discipleship involves a teachable spirit. Discipleship is a life-long process. Who are you discipling? And who is discipling you? Sometimes we forget that if we have come to know the Lord, we are now in the process of sanctification. That means we are not in a glorified state where we are free from sin and all the challenges of this world. Honestly, we sometimes treat Christians as if they should act as if they are in a glorified state. That means no sin, and perfect holiness. But the question is, how does God sanctify and transform us? I believe this chart is helpful. God does transform us. But it involves our cooperation. If we are willing to yield to God, through his Word, and allow others to be involved in the process, we will change. Also, suffering and circumstances can be used to change us as well. 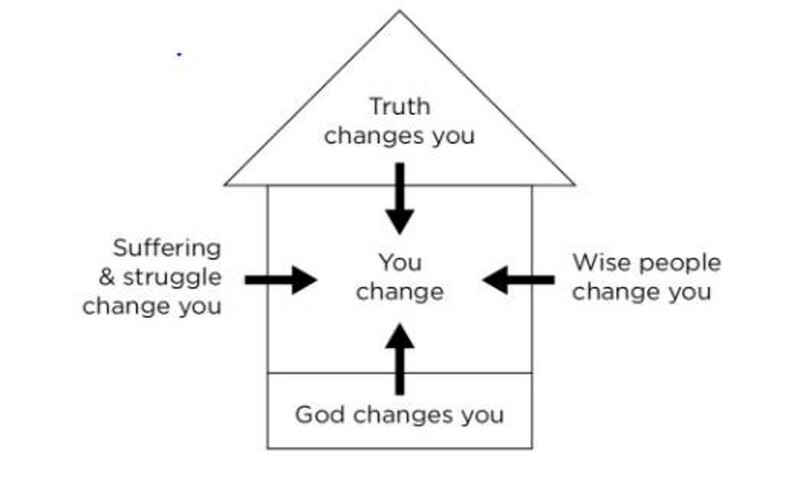 The question is “How do we respond to God in this specific circumstance?” Note the chart mentions truth is what changes us. Truth comes though the Bible, others speaking truth to us, prayer, service, etc. But I truly believe the reason we don’t always see the transformation we want isn’t because of God. It is on us. He has given us His Spirit, the Word, community, plenty of resources (lectures, books, online resources), etc. In most cases, it is our stubborn will won’t budge. Now keep in mind, this isn’t about a formula. It is about us cooperating with God so that we might experience the change he wants for us so we can bring honor and glory to Him. I have to be the one who prioritizes reading the Bible, being in community, praying, and doing all I can to cooperate with God. Also, remember, even if you don’t see the transformation in your own life or in others, it doesn’t mean the Gospel is false. Jesus could still have died and risen 2,000 years ago. Our actions don’t determine the facts of history. So remember, we can be transformed. But we have to do our part. Previous Article Was Jesus Really a False Prophet?